Nutella Crunch Cupcakes – A super moist chocolate cupcake, dipped in creamy Nutella hazelnut spread, and crunchy chocolate pieces. The perfect combination of textures that will satisfy any sweet tooth! I recently had a revelation – I haven’t make cupcakes in an extremely long time. Months? No wait, I think it’s been years!! I’ve been focused on creating new desserts that I hadn’t made before that I ignored one of most classic desserts that a baker can make. As a result, I was determined to try out a new cupcake recipe that would stand up to all unique desserts that I’ve showcased this year, including these whoopie pies, this tres leches, and these marshmallow bites. But how?? Nutella is the answer to most of life’s problem so it was a no-brainer for this cupcake. But I also added a little extra crunch to add another layer of texture to these cupcakes. If there’s one thing you need to know about me is that I love multiple textures in my food. Creamy, gooey, crunchy all in one dessert?! Yes, please! 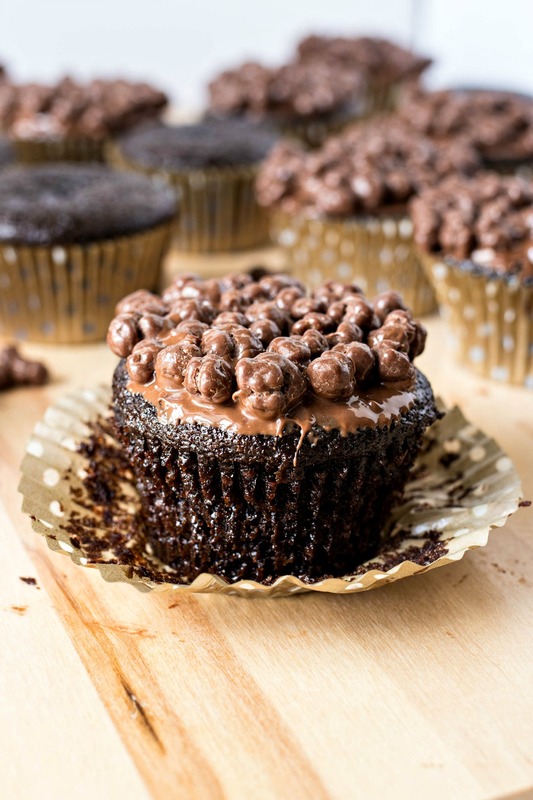 So say hello to Nutella Crunch Cupcakes! When it comes to chocolate cake, more often than not the cake is dense and dry. But not this recipe! Thanks to a super wet batter, these cupcakes are insanely moist. After the cupcakes cool down, they’re then dipped in luscious Nutella and finished with a layer of crispy chocolate crumbles. Look at how they glisten! I used Buncha Crunch for these but you can use Crispy M&Ms or chopped Kit-Kats or even chopped Crunch bars to help you achieve the bonus crunch. These cupcakes are insanely simple to make, mostly because the batter is made in one bowl. No need to keep the dry and wet ingredients in separate bowls for this recipe! Do NOT overfill the cupcakes! I suggest only filling about 2/3 full. I filled about 4/5 full for my test sample and it overflowed. Do not remove the cupcakes until they are completely done, which means a toothpick will come out completely clean when inserted. No crumbs should be present. Usually I don’t follow this rule because I like ultra-moist cupcakes but since this cake is really wet, they will sink if undercooked, even a little bit. Make sure the cupcakes are COMPLETELY cool before topping them. Since they’re super moist, they’re super delicate so if you dip them in Nutella before they have a chance to cool, the Nutella will act like a glue and rip off the top of the cupcake. Speaking of Nutella, it’s much easier to dip the cupcake when the Nutella is slightly melted. So I recommend melting in the microwave for 15 seconds before using. This recipe uses a cup to coffee in the batter to add depth to the chocolate cake. You’ll never even know the coffee is there, I SWEAR! You can slightly taste it in the batter before baking, but once it’s baked, there’s not even a hint of coffee flavor. But instead, you taste a yummy, chocolatey cupcake. So don’t exclude this coffee from your recipe! There you go – that’s all there is to it! These cupcakes were a HUGE hit in our home and wit friends so I just KNOW you’re gonna love them too. Enjoy!! A super moist chocolate cupcake, dipped in creamy Nutella hazelnut spread, and crunchy chocolate pieces. The perfect combination of textures that will satisfy any sweet tooth! Preheat oven to 350 degrees. Line a cupcake tin with paper liners. Set aside. In the bowl of a stand mixer, add sugar, flour, cocoa powder, baking soda, baking powder, and salt. Fit the stand mixer with whisk attachment and lower. Mix on low until dry ingredients are completely combined. Add eggs, buttermilk, coffee, oil, and vanilla. Mix until completely combined, about 2 minutes. The mixture will be runny. Scoop into prepared muffin tin, filling each cup 2/3 full. If you fill any higher, the cupcakes will overflow while baking. Bake in preheat oven for 17 minutes or until toothpick comes out COMPLETELY clean, without any crumbs. Remove from oven and let them cool on a wire rack. Let cupcakes cool completely before topping them. Place Nutella in microwave safe bowl and microwave 15 seconds to thin it out a little bit. Stir with a spoon. Place crispy chocolate crumbles into a separate medium bowl. Dunk the top of a cooled cupcake into the Nutella and then into the crumbles. Repeat with remaining cupcakes. Serve immediately or store for up to 2 days. Ummm I wish I never found your blog post. LOL!!! I want to make these SO badly! Mmmm this cupcake recipe looks so delicious! I’ll definitely be saving it to Pinterest and trying it sometime soon! Thanks for the inspo! Oh my goodness, Nutella is so yummy, and these cupcakes look devine! Thanks for sharing! My nephew LOVES Nutella. I’m going to have to make these for him! Thank you so much for this recipe. You did a phenomenal job with this cupcake. It looks so moist and delicious. Oh my goodness! These remind me of being in Paris. So delicious! You’re right: no trouble can withstand a fabulous cupcake! I will keep this recipe on hand for when the time comes 🙂 I love how moist they look, and that you added coffee for an extra layer of flavor. YUM! Thanks so much! The coffee is so perfect because it enhances the chocolate flavor but you wouldn’t even know it was there! YUUUUMM! THese look scrumptious! I’ll have to tell you how they taste once I’ve tried them out! These cupcakes look beyond amazing! Especially love the crunch topping. Yum! I seriously cannot wait to put this goodness in my mouth. I think that I am going to need about 12 of these all to myself, please. They look delicious! OMG these look absolutely amazing! Oh my glee! These cupcakes look so delicious! 🙂 I am totally going to pin this for later! Ohmagosh!!! I’m salivating. These look amazing! Pinning for later. These look brilliant! I can’t wait to try them! Pinning for later! Wow! now that’s a cupcake. Pinning for later! this looks absolutely amazing!!! sooo very good. Thanks so much! I am so glad you like them! WOW these sound absolutely incredible. YUM! How can you go wrong with nutella!? These look amazing! These cupcakes look absolutely perfect, as if they were from a bakery. I love the chocolate crumbles on the tops, such a pretty addition. Aw thanks so much! The crumbles are my favorite part! Gosh, Nutella on anything is basically the greatest thing on Earth. Nutella and banana is my favorite combo, so I’d probably add some banana in the middle! Ahh nice call! I love that combo too. I love nutella anything. I love cupcake anything. You have combined two things I love. Oh my- amazing! Yay! I am so glad these cupcakes spoke to you! I’m afraid if I had these in my house, they would be gone in a day! I LOVE nutella and those cripsy chocolate bits look divine! I cannot wait to try! I quickly handed the extra cupcakes off to friends. I would inhale them all too! I need to make these asap!! Love nutella and crunch candy! Delicious! This looks amazing! Such a great idea and they look so cool too! Nutella really does make everything better! That plus the chocolate crunches on top. Yum! I’ve never tried Nutella but these look absolutely delicious! I’m going to have to try it now! Oh man! You are missing out. It’s been a staple in my house since my dad used to make PB and Nutella sandwiches! Oh my goodness, these look absolutely amazing. I cannot wait to try them! Omg these look so good! I love Nutella, so I definitely want to make these now! Omg pure chocolatey goodness!!! I need one of these A.S.A.P. SHUT the front door. These look incredible!!! OMG! These sound soooo good!! And they look amazing! These are a SITUATION. my daughter is obssessed with nutella.. its one of the few foods she eats… these look amazing!